This Guide is would not be possible without Whilhelmina‘s fantastic Beastlord FAQ she wrote during Beta. Beastlords really are a very different class, which means we get a whole new set of UI elements. This includes a Beastlord Bar, a Savagery Bar, a new tab in the Character window for keeping track of all your Warders (pets), and a large blue Weakness paw icon which comes up whenever your Warder pet is ready for you to fire off an coordinated attack. If all of this were available at level 1, you’d be overwhelmed, so these features are unlocked as you level up. There’s also an in-game tutorial specifically for Beastlords. At level 1, you get your first warder (based on your race). At this point, it really just acts as a basic pet and you can’t do any special abilities with it. At level 10, you gain two new abilities: Tame Warder and Stare Down. As soon as you spend your first point in the Animalist AA tree, you also gain the ability Beastmaster’s Sight. How do you know that an animal can be tamed? When you cast Beastmaster’s Sight, you will see every potential warder in the vicinity start glowing blue. You will also see a list of nearby creatures which can be tamed posted in your chat window, as well as which family of Warder they belong to. Once you decide which creature you want to tame, you will need to fight it and bring it to below 50% health. Now I don’t know about you, but ths type of gameplay drives me crazy. Tame Warder is an extremely slow casting ability, and it is very likely that the mob will interrupt you. Once you bring the mob below 50% health, you should use the Cheap Shot scout ability to temporarily stun the mob and then cast Tame Warder. While you are casting Tame Warder, use the Stare Down ability to stun the mob for another 2 1/2 seconds. Cheap Shot and Stare Down both increase your chances of successfully taming the mob. Once you are successful, you will gain a new ability called Summon Warder: and the family of Warder you tamed. If you already have a warder of this family, you’ll just update the appearance of your warder. For instance if you already had Summon Warder: Feline with a tiger appearance and you tame a leopard, you will simply replace the appearance of your Feline pet with that of a leopard. This change does not affect the level or skill of your warder. Tip for Taming Low Level/Low Health Warders: This can be very tricky especially if your character is a much higher level than the creature, or the creature is a very low tier with minimal health. There are a few things you can do here. You can strip off all your gear except for your main weapon. You can also turn off any buffs you have which do damage. Finally, you need to cancel your current pet so that you can create a new one. There are 16 families of warder : 12 normal and 4 exotic. You gain the ability to tame normal warders at level 10. Pets are either offensive or defensive types. Exotic warders become available at level 80 once you have spent enough points in the Beastlord AA tree to get the bottom end line ability “Tame Exotic Warder“. How do you find out how fast your pet is skilling up, or what combat arts your pet has, or what your stored pet looks like? Open your Character window and click on Warders. At the top of the window, you can pull down a menu to view each of your 16 Warders. Just below the Warder selector menu, there is a progress bar which is the Warder’s Affinity or XP bar. Your Warder will slowly gain experience as it combats alongside you and will skill up from Apprentices to Grandmaster. Once your pet completely fills up the Grandmaster level, you will gain the Primal ability shown to the right which you can use on all your warders. You may view the progress of all your Beastlord warders by viewing your character on EQ2U. NOTE: Warders do not start gaining Affinity until your beastlord reaches level 30. In the Warder tab, at the bottom, you can see the Combat Arts and Spells which your Warder will automatically use during combat. You have no control over these, but you can upgrade them by spending AAs. If you click “Stats” while viewing a Warder, then the Stats flyout on the right side of the Character window will reflect those of your Warder. At level 18, you gain access to the Beastlord bar. On the LEFT side of the Beastlord bar are 4 slots which hold Advantages. During combat, your pet will open up Weaknesses in the enemy, which is indicated by a warbling sound and a large blue paw icon to the left-of-center of the screen. Once a Weakness opens up, you have a few seconds to click an Advantage which can do direct damage, provide a group buff, or debuff the enemy. At level 20, you will see another part of the Beastlord UI called the Savagery bar. During combat, you will start to build up Savagery by fighting alongside your pet. On the RIGHT side of your Beastlord bar are 6 slots that hold Primals. Casting a Primal ability requires a certain amount of Savagery to have been built up. Primal abilities get more powerful the more Savagery you have built up. Using Advantages quickly builds up Savagery, but Savagery then slowly decays when you are out of combat. If your Beastlord bar doesn’t show, try typing /togglebeastlordwindow. If you find the window to be too wasteful of screen space, you can right-click it and choose Minimize to reduce the Beastlord Bar down to the appearance of a standard hotbar. If for some reason your Savagery bar is missing, type /togglesavagerywindow . Pet Window Note: for those not familiar with pet classes, when viewing the Pet window, the green bar represents health, blue is power and yellow is threat. You can also name your pet by right-clicking in the Pet window and choosing Pet Options. Now so far, everything we have been talking about takes place when your Beastlord is in an Offensive or “Feral” Stance. The Advantages and Primals you’ve been using so far are also “Feral” in nature. At Level 30, the Spiritual Stance becomes available. If you are in a situation that calls for more healing or otherwise a defensive stance, you may switch to your Spiritual stance. The first time you enter a Spiritual Stance, you’ll need to change out the Advantages and Primals on your Beastlord Bar with Spiritual ones. When you are in Feral Stance, only Feral Advantages and Feral Primals will work. When you are in Spiritual Stance, only Spiritual Advantages and Primals will work. 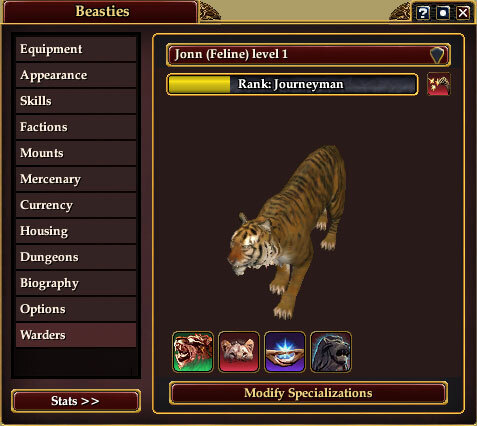 Rather than fishing around in the Knowledge book, you may customize your Beastlord bar, by right-clicking on any Advantage or Primal. A popup should appear which shows you the other Advantages or Primals that will fit into that slot. Fortunately, the game remembers which Advantages and Primals you’ve picked for each stance and will swap them out as you switch stances. NOTE: Certain abilities will only go in certain slots on your Beastlord bar. You’ll find that there are Slot 1, Slot 2, Slot 3, and Slot 4 Advantages. The same arrangement applies to Primals. Summon Spells: Rather than having an entire hotbar filled up with Summon spells for each of your warders, you can place a single Summon spell on your hotbar, and when you right-click on it, you’ll get a popup that shows all the pet families you’ve unlocked. At level 30, your pet will start to gain Affinity. While your Warder pet is always exactly the same level as you are, when you first tame a Warder, their abilities are only at Apprentice level. Only through adventuring with your pet can you hope to increase that pet’s skills from Apprentice, Journeyman, all the way to Grandmaster. This is a slow process, and the goal is not that you can have all 16 of your Warders Grandmastered out in a few days. There is a series of six quests you can complete with your Beastlord which can give a major jump in the Affinity of your pet. When you open your Alternate Advancement window, you’ll notice a Warder tab named for your pet’s Warder family (Avian, Simian, etc.). Although this tab appears in your AA window, you don’t spend AA points here. Instead, at level 22, you start gaining Warder Specialization Points to spend in the Warder tree. You gain one Warder Specialization Point for every 2 levels from 22 to 90. At level 90, you can spend 35 Warder Specialization Points in each of the 16 pet trees. NOTE: Warder Specialization Points are not “shared” between pets. Each of your 16 pets can have up to 35 points spent. Level 18 : Weakness & Feral Advantages – When attacking with warder, you’ll see a blue paw. While active, you can use one of your feral advantages (left part of BL bar). You’ll need to have your Feral Stance active. Level 30 : Spiritual Stance, Spiritual Advantages and Spiritual Primals – You gain another stance, which is a healing stance. Launch it and then right click your advantages and primals to set them to spiritual advantages and primals. Level 30 : Pet Skillups : you’re pet will start to skillup from Apprentice to Grandmaster when you use Primals. Level 80 : With 31 specialization points, you’ll be able to choose a 5th slot Primal ability. Awesome. I’d go roll one right now, if hadn’t spent all my play time figuring out why my launcher crashes every time (answer: vista permissions must be reset on the game folder to owner) and helping a friend solve his “oops, all my characters are gone!” problem. But after all that is done, I will read this one more time and then get started. The FAQ is mostly the same but shorten up to be able to fill a single book. So, any word on the BL epic weapon quest line yet? I gotta wonder, if you claim and use the Warboar warder, then later tame a pig, since it’s the same family, how do you get the Warboar appearance back? Or are you SoL . . . The warboar is actually it’s own family with the exact same AAs tree and abilities. You can tame a pig and have the warboar and spec them differently. Also, Feldon, Feral Stance is no longer ungraded at 25 (unless it’s not done automatically for some reason). so one thing I noticed but did not find a answer for here, I have a grandmaster frog (affinity lvl 6) his spells still read apprentice and he didnt seem to get the spell thats beside the affinity exp bar, is it suppose to be like this? currently working on my 2nd pet and it says he is lvl 2 (adept) now but still apprentice abilities… guess my question is are all abilities appr always and how do we get the one thats listed beside the affinity bar? nm figured it out, the spell beside the affinity exp bar actually becomes placeable on my savergy bar if I so choose to do so. Just thought I’d let people know you don’t need to cancel your warder right away when trying to tame a new one. You only need to cancel it in order to cast the “Tame” power. I was trying to collect one from each of the families last night on my 11 BL and was having problems getting a Gorilla out of Mok Rent. I left my warder up and let it tank the Gorilla till it was under 50%, canceled my warder and then was able to “tame” the Gorilla with out dying. There are tigers in the Oasis areas in Sinking Sands, on the Isle of Mara and there are tigers in Kunark. I don’t know where there might be tigers in Commonlands. Ok, checked the tigers in Oasis – no dice for some reason. The message I got was something like “Your art cannot be used on this….” No idea why. So I went to KJ, and no problems. And if you bring a friend to group, taunt, and lower to less than 50%, there really are no problems aside from one or two resists of Tame Warder. Any updates to Warders I find I will be posting on the BL Warder page since that is where this should go. The link to the warders guide is currently broken. awsome. beastlord is my favorite class it is way better than warden. Feldon, question for you – that first picture of this guide (which is again awesome, btw), what deer/elk is that? I’ve been looking and can’t find it. The deer in Shard of Love. Did another editing/cleanup pass in anticipation of my Beastlord Advanced Guide. Ok, got the deer and the lion. Sadly, when you tame the deer you lose the particle effect, so I was a tad bit bummed. Also, there was a podcast or something from SOE where two guys who worked on the BL’s were interviewed. In it, it stated that there was something in the AA trees to stops savagery from degrading. I know there’s one that delays it for 20 seconds, but is there one that stops it from degrading completely? If so, what is it? Also, for the newbies trying to understand beastlord AA’s, is anybody aware of a guide covering that? I know it’s a lot to ask, but as I’m leveling mine up, I have a million questions, lol. Excellent write-up 🙂 This class obviously requires a fair bit of research and thought, which is great. Thanks also for showing us how to link to an in-game notebook! I am frustrated with the beast now. I am level 84 and suddenly my advantages bar never lights up any longer. The blue paw comes up and the savagery bar goes up but the spells no longer light up and can not be used in combat. Any idea? I can not find anything at all about this anywhere. Please ignore the above. I realized (actually my husband showed me) that there are spells that are for Feral or Spiritual stance and I had no clue that I had triggered the spiritual one instead of the feral one. I do know alot more about what is what with the Beastlord now though so its all good. V Nice work on this guide. Many Thanks. Quick question for you. Since the level of the pet remains at what it what when u tamed it does the pets level have any relevance. Should I leave it as long as possible before I tame pets to get ones of a higher level? The warders should level with you. Finding different pets in the same family just changes the appearance of the pet. Your warder starts leveling when you are level 30, and the enemy must live long enough for a Weakness to be triggered, and an Advantage fired. Generally, when leveling a warder, you send in the pet first, then use an Advantage, then kill the mob. Terrific Beastlord article.Thanks for all the great info. One thing I would really love to see is a good factual writeup on the BL epic weapon quest. Many questions concerning this arise. I know the BL is the most terrific toon I have played and I currently have 21 toons, adventurers and tradeskillers. I am not a raider, just one of those “lowely casual players” who plays about 5-6 hours every night. I take my level 74 BL places I wouldn’t take some of my level 90s solo. However the BL epic seems so outrageously hard and while all other epics are started at 80 you have to be 90 for this one. It seems you have to almost have hard Raiding gear to kill some of the bosses and COME ON! a 98^^ BL and 98^ pet (who you can’t kill before you kill the BL) versus a 90 bl and 90 pet SOLO!. What is the series of 6 quests to get affinity with a warder? INSECT – Feral Primal : uses 50 savagery, must be in flanking or behind, direct poison damage, attack speed and DPS buff. Varies with savagery and feral rampage level. Is a quest required to tame Insects? I tried the listed mobs and was unable to tame them. Cant seem to find a good list of mobs that can be tamed… have almost all of the pets but is there a list of where different ones are for like appearance sake? seen alot of ppl with different ones but cant seem to figure out how they get those. Great guide, thanks a lot – made my new beastlord’s life a lot easier!